Today we will talk about one of the gene superfamilies that we are working; the Nuclear Receptors (NRs). The NRs are transcription factors, which act as a translator of environmental stimuli to the molecular language of the cells. They function as receptors of hormones and others endogenous and exogenous molecules like vitamin D and several pollutants. By interacting with regulatory regions of target genes to perform its various functions in homeostasis, playing important roles in the regulation of cell growth, development, basic metabolism of metazoans. The NRs have the ability to directly bind to DNA and regulate gene expression of other genes. 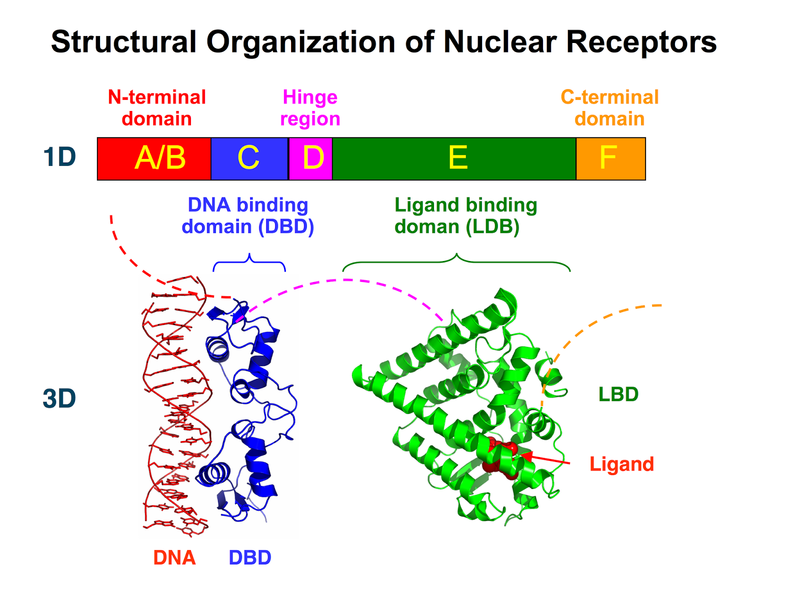 All nuclear receptors share a similar organisation classified in six homolog regions, but just two of these regions are very conserved: the DNA-binding domain (DBD) (region C) and the ligand-binding domain (LBD) (region E). The most conserved is the region C that contain two zinc fingers that binds to specific sequences of DNA. These zinc fingers are used to find the P-box that characterises this region and confers specificity to a target region of the DNA. Region E is also conserved, but has more aminoacids changes than region C, therefore is classified as a moderately conserved sequence. In our first analyzed transcriptome, the Pterygoplichthys anisitsi, we found 13 different transcripts (mRNA) of NRs and we had succeed in the identification of the domains C and E in all these mRNA. Sure things; we accomplished this after reading tons of papers to learn about the Nuclear Receptors. So, we will continue working hard for more posts like this. I hope you enjoyed. See you soon!